About a nanosecond after Manny Pacquiao finished pummeling an overmatched Chris Algieri in Macau on Sunday, that question was raised. And the Filipino superstar didn’t flinch. By dispatching Algieri so ruthlessly, Pacquiao has now cleared the deck for the Mayweather fight to happen. Though he failed to knock out the huge underdog, Pacquiao (57-5-2) did knock him down six times in the 12 rounds and won a lopsided unanimous decision at the Venetian Macao’s Cotal Arena. Neither Pacquiao nor Mayweather has another fight on the docket, making next spring an ideal time for a megabout that the entire boxing world has wanted to see for more than five years. Negotiations are supposed to be ongoing between Bob Arum and HBO on behalf of Pacquiao and Les Moonves, head of CBS Corps. that owns Showtime and the rights to Mayweather’s next two fights. The Pacquiao camp has made it clear why the fight hasn’t happened and still might not happen: Mayweather. Without question, the pressure is mounting on Mayweather, who is not unfairly perceived to be the one avoiding the fight. 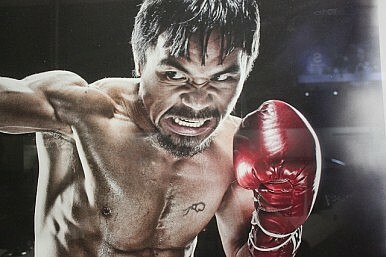 Over the last few years, he has made various demands on Pacquiao for the match to take place. Every time the Pacquiao camp consented, Mayweather has made new demands to scuttle a potential deal. But Father Time might finally persuade the reluctant Mayweather to put his unblemished record on the line. He will turn 38 next February while Pacquiao is about to turn 36. The much-anticipated bout, even if it happens, will take place at least five years after both fighters were at their peak. It’s been five years since Pacquiao won a bout with a knockout and three for Mayweather. Make no mistake, while there are many fine points to be negotiated by the two camps, there will be plenty of money for everyone. The pay-per-view take will shatter all records in boxing history while the fighters will make in excess of $50 million each, with more going to Mayweather. They’ll even have a venue befitting the magnitude of the fight available. AT&T Stadium, the home of the Dallas Cowboys and better known as “Jerry World,” is being offered by Cowboys owner Jerry Jones as the stage for the event. With seating capacity well over 100,000, it’s the closest thing to a national stadium in America. “I do know there is no question that we can have the largest gate in boxing,” Jones told Yahoo! Sports on Sunday after Pacquiao’s victory. “We’re perfect for it because of numbers. We’re a proven boxing venue. Our venue would really extend ourselves in every way imaginable, financially or otherwise. Attendance at AT&T Stadium will easily dwarf a fight held in Las Vegas, where arenas usually seat fewer than 20,000. But Mayweather may resist a bout held away from his adopted home city. He has not fought outside of Sin City since a November 2005 bout in Portland, Ore. Pacquiao, on the other hand, has fought twice in Jerry World, winning both bouts in 2010. In truth, at this point the only person who can prevent this fight from happening is Mayweather, who is financially secure (unlike the perpetually strapped Pacquiao) and calls his own shots. The question is whether the man nicknamed “Money” wants more cash while in the process securing a legacy that can only be cemented with a win over his archrival. Could Pacquiao vs. Mayweather Finally Happen?Will Saturday’s Fight Be Manny Pacquiao’s Last?Manny Pacquiao, Brandon Rios to Fight in Macau this NovemberWill Manny Fight Mayweather?Is Boxing's Tokyo 2020 Olympic Future on the Ropes?